The Z-10, sometimes called the WZ-10, doesn’t get as much attention as the rest of China’s latest military hardware. What is currently known about the Z-10 is quite comprehensive though, albeit still subject to change once more reliable facts have surfaced. But the Z-10 is remarkable because the PLA finally have the tank killer they’ve always wanted. Developed by Changhe Aircraft Industries Group (CAIG), it took almost 20 years before the first operational Z-10’s were delivered to the PLA. To form a cursory backgrounder on the Z-10, much of its origin story can be gleaned from online “open source” reading. These reveal how the work on the Z-10 occurred in the 2000s, primarily between the 602nd Research Institute and CAIG following years of unsuccessful bidding for attack helicopters abroad. It’s believed that by 2003, the first prototype Z-10’s were flight tested. 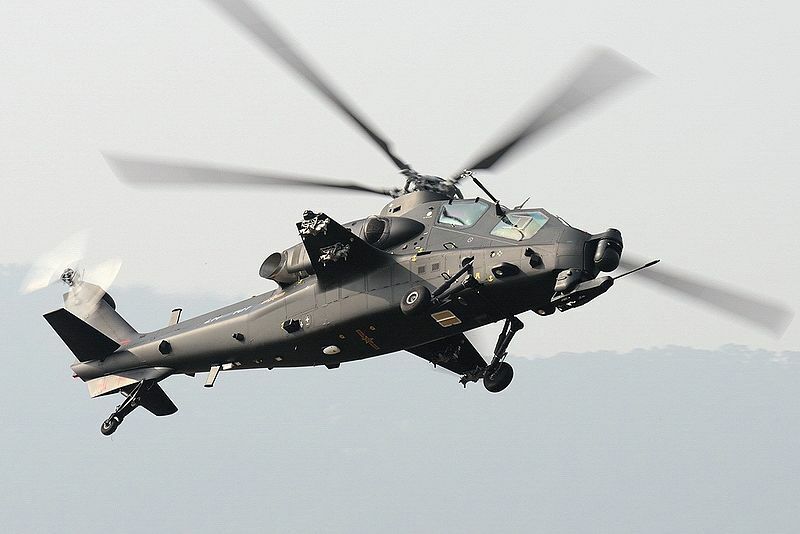 The appearance of the Z-10 reveals a startling similarity to the South African Rooivalk and the Italian Mangusta. The Z-10, however, carries fewer weapons than the former and weighs more than the latter. Its two-man crew are ensconced in what is called a stepped cockpit protected by bulletproof glass. The range of avionics its gunner (front) and pilot (back) operate can only be speculated. 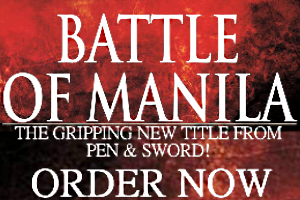 It’s equally unclear if its chin-mounted cannon is chambered for 20mm, 23mm, or 30mm rounds. The bulb on its nose is a sensor, commonly known as a targeting ball. It must be noted that the sloping fuselage design of the Z-10 is a stealth feature, although how much it can evade actual radar detection is unknown. 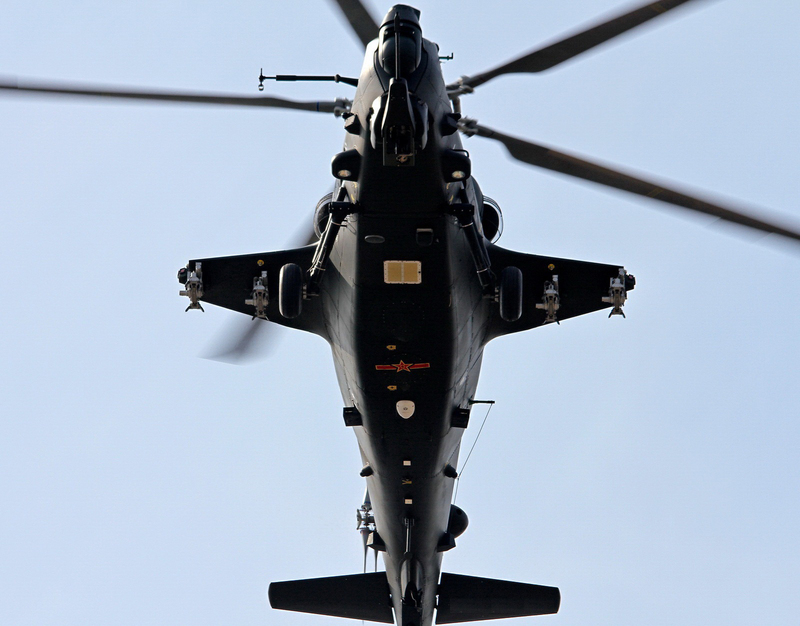 In March this year Aviation Week reported that Russian helicopter firm Kamov actually designed the Z-10. It cited designer Sergei Mikheyev who claimed the so-called Project 941 in 1995 was a hush-hush affair between Kamov and the Chinese. There are no other sources that explain in detail why the Z-10 resembles a European designed helicopter. Like most of its peers, the Z-10 has four hardpoints on its wing mounts suited for ATGMs and rockets. The missiles it could carry are speculated to be either the HJ-9 or HJ-10, both of which are derived from US technology. The Z-10 is also capable of mounting SAMs for anti-air missions. The Z-10’s development has been highly controversial. Five aircraft were powered by Pratt & Whitney Canada PT6C-67C engines fitted with full authority digital engine controls developed by Hamilton Sundstrand. Following investigations by federal agencies, United Technologies Corp., the parent company of the two firms, was fined $75 million for violating the Arms Export Control Act and making false statements in connection with the illegal export to China of U.S.-origin military software in June 2012. As a result of the above fiasco, newer Z-10’s might carry either Ukrainian or Russian engines that are more accessible for the PLA. Indeed, the reliance on reverse-engineered or imported engines isn’t unique to China’s burgeoning aircraft industry. Most Chinese manufacturers are at pains to develop any type of engine, be they for tanks or warships. Performance-wise, the Z-10 can reach 300 km/hr with an unspecified maximum range. At 46 feet long (14.1 meters), the Z-10 is propelled by a five-blade main rotor whose diameter is either 39 feet (12 meters) or 42 feet (13 meters) and a four-blade tail rotor. From its front landing gear to its rotor, the Z-10 stands 12.5 feet tall (3.8 meters). Its landing gear is fixed and can’t be retracted. Unfortunately, little is known about its armor. The gadgets inside the Z-10’s cockpit include the usual HUD display, GPS navigation, TV-guidance, infrared, and night-vision systems. The Z-10 is to be deployed with the PLA’s light helicopter (LH) brigades in squadrons of 12. It’s believed that between 50-60 Z-10’s are now in service, with more arriving to augment 10 LH brigades. The Z-10 isn’t available for export. A “sibling” scout version called the Z-19 is scheduled to enter service soon and operate alongside it.